In today’s fast-changing financial markets, sound advice, leadership, and management are essential to achieving goals. At Humphrey Wealth Management, our advisors apply the process to building carefully diversified portfolios* that take the appropriate amount of risk for each individual client. Their approach provides the financial guidance, direction, execution and understanding enhanced by cutting-edge tools. .
For investors, the importance of establishing and operating within the context of clearly-defined and well-articulated investment principles cannot be overstated. These fundamental investment precepts provide the framework upon which investors build portfolios with the greatest probability of meeting their goals. Our principles—informed by a rich understanding of human psychology, an appreciation of financial theory, a deep awareness of history, and close monitoring of current events—emphasize the factors most likely to enhance long-term investment performance while de-emphasizing the factors most likely to interfere with achieving both short and long-term goals. Powered by the quality standards, processes, and analysis methods developed by the well-known economists Ben Graham, Peter Lynch, and NYU professors, Michael Baum and Michael G. Zahorchak (esteemed author of Art of Low Risk Investing), our advisors provide clients with a customized roadmap to confidently help identify and achieve their most valued goals. Investing is both art and science, and determining your optimal allocation can be complex. 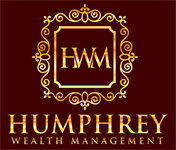 At Humphrey Wealth Management, the cornerstone of our investment philosophy is founded in your future. We strive to provide the assurance that you will never run out of income and will be able to provide a legacy for your loved ones.